Create a tropical paradise with the Parrot Tulip Mixture. This scintillating collection blooms in mid to late spring and grows between 20 to 28 inches tall. Ruffled, frilly petals curl upwards to create crimped, cup-shaped flowers, whose exotic curves are complemented by rare and wonderful colours. Tulipa 'Parrot Mixture' includes soft white, pink, and coral flowers, darker amethyst and reddish black blooms, and various bicoloured strains in dazzling combinations like cream and crimson and yellow and burgundy. 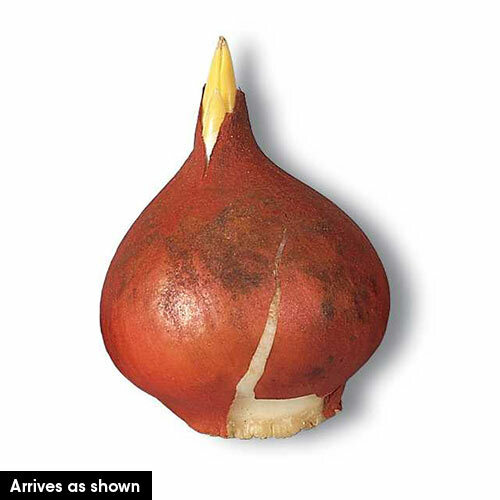 For the biggest, boldest blooms, plant your parrot tulip bulbs in the fall, about 6 inches deep and 3 to 6 inches apart to avoid overcrowding their gorgeous 4- to 5-inch flowers. 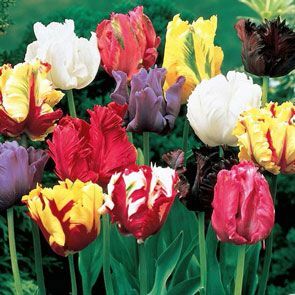 This sultry tulip mix loses its luster when exposed to too much moisture, so make sure to choose a sunny or partially sunny location with well-drained clay, loamy or sandy soil. This ravishing mixture of Dutch tulips thrives in hardiness zones 3 through 8. Use these birds of paradise to add some eye-catching fringe to borders and beds. Consider accentuating their eccentricity by planting them alongside equally flamboyant varieties of bearded irises, or create some playful contrast by pairing them with the crisp, clean lines of your favourite spring daffodils. Fly high with the Parrot Tulip mixture. These flamboyant, feathery-petalled Parrot Tulips command attention in any garden or bouquet. Big, vibrant flowers with incised, fringed petals create the atmosphere of a tropical wonderland filled with birds of brilliant plumage. Colour coordinated for the most vivid display.